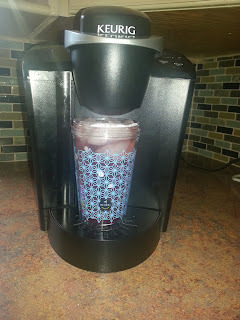 I have been a Keurig owner for a few years now and I absolutely love it! I have always been a tea drinker, but I didn't really start drinking coffee until Keurig came into my life. Everything just tastes so much better when it is brewed fresh in this awesome machine. If you wondering "Is it Frugal to own an expensive coffee machine like this?" The answer is YES. Ask me how often I visit coffee shops? Pretty much never. Most people that I know spend more money in three months at a coffee shop than it would take to buy a Keurig. Plus, with a Keurig you have the added benefit of not having to interact with a stranger before having your morning caffeine. I was so excited to receive this package. Since it is so dang hot in Florida; I often even prefer my caffeine iced. 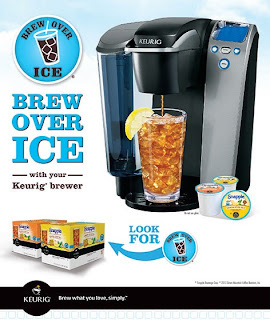 I have been known to ice all types of drinks from my Keurig, but the specially designed Brew Over Ice items make it even easier. I really love the high quality of the Tumbler. I have been dragging this tumbler with me everywhere recently. My ice bucket arrived cracked. Luckily it is still useable and doesn't leak. It is really neat how it lights up on the bottom. I will definitely be putting the ice bucket out for parties in the future. 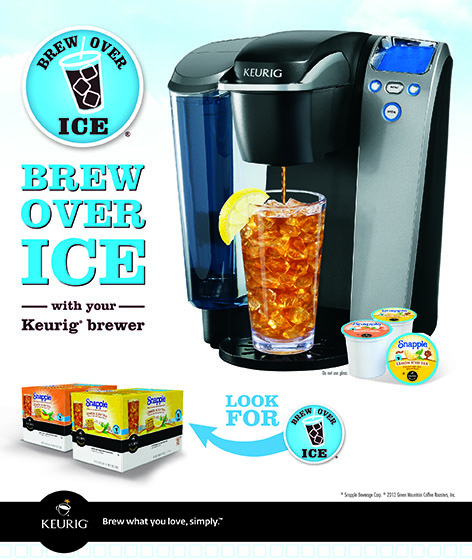 The Brew Over Ice process is super easy. 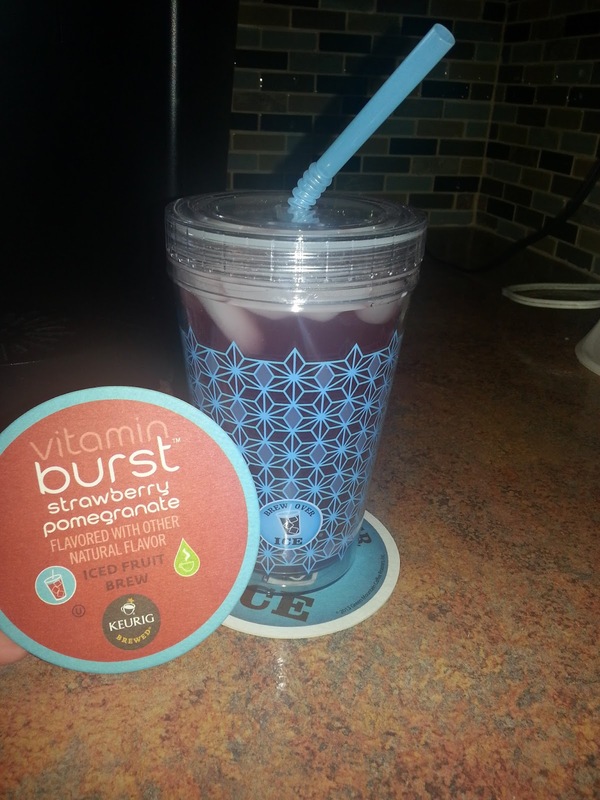 You fill your tumbler with ice (I fill mine up all the way), put your K-cup in the machine and press the button for it to brew. I do find that my hot water melts most of my ice and I do have to take a few sips and add more ice to get it to the perfect temperature. Now, for the K-Cups themselves. I was sent three flavors: Vitamin Burst Strawberry Pomegranate, Snapple Peach Iced Tea and Donut Shop Sweet and Creamy Regular Iced Coffee. Let's start with my favorite: the Donut Shop Sweet and Creamy. This surprised me since I didn't think I was going to like it. The flavor was really good, but it didn't have that yucky aftertaste that coffee sometimes has. It was just sweet and creamy deliciousness. I also really liked the Vitamin Burst Strawberry Pomegranate. I loved the flavor! It was sweet, but not overly sweet in my opinion. I have an intense hatred for Peach. 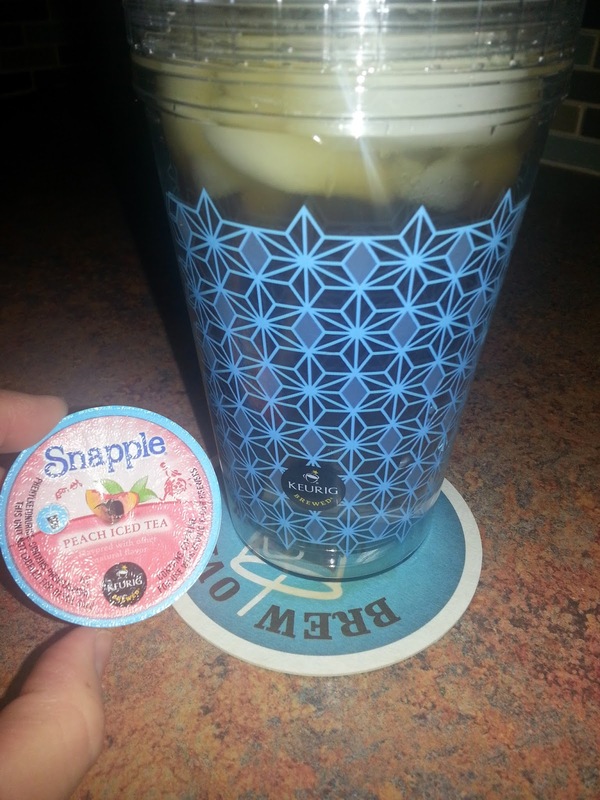 I still gave the Snapple Peach Iced Tea a try, but my taste buds could not overcome the Peach. It was my least favorite of the three. I think I would really like the Snapple Tea if it was in a different flavor though (say Strawberry or Lemon). I forgot to take a picture of the Donut Shop Sweet and Creamy Coffee because I polished it off pretty quick. I definitely recommend the Donut Shop and Vitamin Burst K-Cups! They are perfect to help you beat the summer heat. 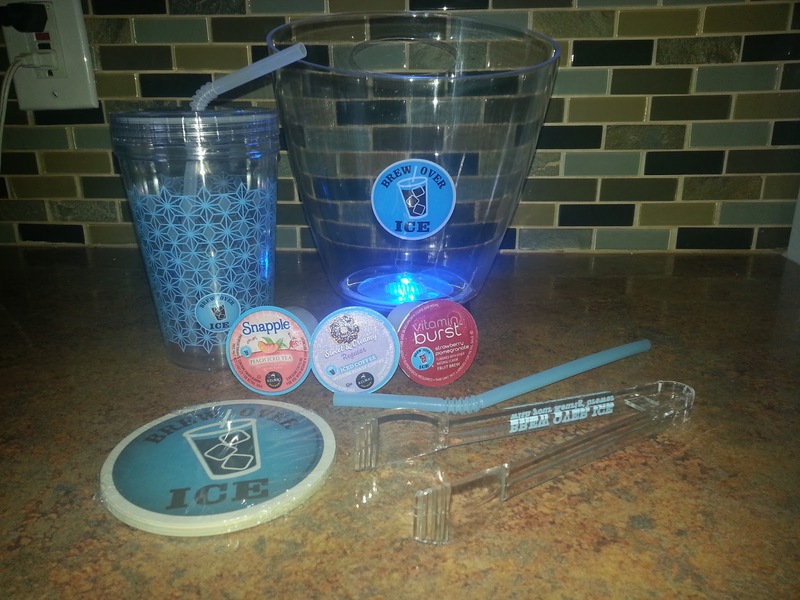 Make sure you enter to win the Brew Over Ice Sweepstakes where you could win instant daily prizes and even $10,000. my favorite is Green Mountain breakfast blend with French vanilla creamer, YUM! Haven't tried any yet, but I know I'd like the Smapple Peach Iced Tea. I like the green mountain french vanilla. I entered to win the #BrilliantHEClean + Home Depot Gift Card and Tide Sample Giveaway. I use the dark magic k-cups. I LOVE THE FRENCH VANILLA FROM GEVALIA. I'd love to win this - I'm still using a pod brewer! Never heard of this product but would love to have one. I love ice tea! I don't have a favorite but I do love dark bold blends. I like the French vanilla coffee. My favorite is the Starbucks French Vanilla Coffee K-cups. My fave is the French Vanilla Iced Coffee! I love the Blond Starbucks Coffee in K-Cups. I love The Original Donut Shop Sweet & Creamy Nutty Hazelnut Iced Coffee!